Sidemount is not the preserve of Technical divers, come and try and see if its for you! Equipment logistics are easier than with back-mounted systems. The weight on the divers back on the surface is significantly reduced. Increased mobility underwater and streamlining. Manufacturers are now making specialised equipment. Simple to set up, travel friendly technical rig configurations - just use normal cylinders. Ability to finely tune trim and buoyancy characteristics. You need to be qualified at PADI Open Water (or equivalent) or above, and be at least 15 years old to undertake this course. The course includes a theory session prior to the dives. Followed by a confined water training dive and then three open water dives. 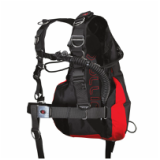 If you want to try sidemount in the pool just to see if sidemount diving is for you we offer a sidemount 'taster' which covers the basic skills and drills for £45, contact us to arrange.